The spine consists of 24 articulating vertebrae, 5 of which comprise the lower back, otherwise known as the lumbar spine. These vertebrae are linked by cushioning discs in the front and a pair of facet joints in the back. Connective tissue ties the surrounding muscles to the spinal column. Motion is achieved through the coordinated movement of the disc and the facet joints. The two facet joints, cartilage-covered bony extensions of the lamina, articulate with neighboring bony extensions of the adjacent vertebra to allow contained motion. 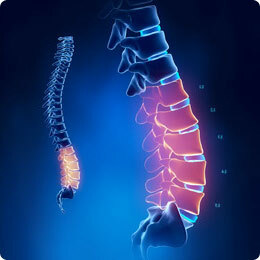 The spine also provides stability and protection of the spinal cord. The lamina, a bony formation that connects around the posterior portion of the vertebra, guards the spinal cord and nerve roots. Several spinal conditions can affect these areas and result in pain and loss of mobility. Such situations dictate that a lumbar laminectomy, a form of spinal decompression surgery, may be appropriate. These conditions include spinal stenosis, bone spurs or facet arthrosis, and slipped disc or spondylolisthesis. An orthopedic surgeon or neurosurgeon spine specialist – a physician specializing in disorders of the bones and skeletal system – can determine the cause of a given patient’s symptoms, and provide recommendations on treatment options. In some cases, the spinal condition may respond positively to medication, physical therapy or other non-invasive treatments. But when moderate or severe symptoms cannot be alleviated by these therapies, surgery may provide the only option for pain relief. One surgical alternative—lumbar spine fusion surgery—can relieve symptoms of common back problems like lumbar spinal stenosis. However, the fusion of two or more vertebrae entails reducing the natural mobility of the spine, as the fused vertebrae can no longer move independently, as they naturally do in a healthy spine. TOPS Posterior Arthroplasty, which involves the reestablishment of the normal spine kinematics, is conceptually similar to hip or knee replacement surgery and can be more effective than spine fusion surgery. Premia Spine’s TOPS™ System has proven in clinical trials to provide better post-operative pain relief and function than fusion surgery. If you are affected by back pain, talk to your doctor about all your treatment options, and find out if Posterior Arthroplasty is the right solution for you.